All wolves are at the Choosing Ceremony, which is a ceremonial day observed each year. Those who are at least 2 wolf years of age will choose one of the five factions (most likely the result of their Aptitude Test or born-faction). When they choose their new faction, they will then become an initiate of that faction. There are five factions: Abnegation (Selfless), Amity (Peaceful), Candor (Honest), Dauntless (Brave), and Erudite (Intelligent). You can only pick one, so choose wisely. After being assigned a Faction, you are too meet at your Faction headquarters and get to know your teammates. Ross sat on the edge of the balcony, above the stage. It was dusty up here, a thick coating covered everything, and the steps she took to get to her spot were visible on the floor. It was like walking through snow, you left tracks and marks everywhere. She was careful not to touch anything, she didn't want a black streak on her before she met the new initiates. She laid down between a large black box and a large wood cut out of a house. She watched the new wolves come in. Even from above she could tell each Faction apart. Some were rough and ready Dauntless, practically picking fights already. They were large, broad, and with a heavy coat. Some had scars on them. She focus on a few other wolves and noticed how they were quiet and kept to themselves. They were generally on the smaller side and thinner than the other wolves around them. Likely Abnegation, she thought to herself. A few, like herself, sat at the edge and observed everything, taking all the knowledge in like a sponge. They were average size and their eyes were bright as they watched everyone moving around, the Erudite. A small group was debating playfully, Ross could hear them from all the way up where she was. The Candor, always arguing and always thinking they were right. At one endd of the stage she saw a couple wolves playing games. She heard the yips and yowls and the screeching sounds of their claws as they ran on the stage. She knew them instantly as Amity. There were few wolves that stuck out oddly, that didn't seem fit in with any of the groups. They were all sizes and shapes. She knew what they were, because she was one of them. They were Factionless. Or, in her case, the Divergent. They belonged to all the Factions and yet they belonged in none of them. When the Choosing Ceremony was over, she'd lead them back to their compound, a rather large rundown house. The established and known Factions had real homes and headquarters. They made due with what they had, and there were plently of foreclosed and abandoned homes. She was the leader of the Factionless, at least until they found their feet and she selected a new leader. She looked out one of the small window and saw the rising sun. Today will be an interesting day, she thought with a small smirk. She licked her lips and focused on the new arrivals. She blew a contented sigh and stood. A small cloud of dust rose around her and followed her to the exit. Her yellow eyes almost seemed to glow as she studied the young wolves below, the light from the stage shown into them. With a flick of her tail, Ross turned and walked to the back of the balcony. Her nails clicked loudly in the empty stairway. She got to the stage door and opened it. She slipped silently out and closed the door. She walked up the stairs and stood before the newly created Factions. Daigo entered The Hub in silence. All around him other wolves who seemed to be part of the Dauntless faction talked and picked fights; normally Daigo would have done the same but at the moment he was slightly nervous. Today was the day, the day he would become a Dauntless like he had always dreamed off. He would fight for the weaker and protect them, he would jump from roof to roof and explore, be wild and free, no rules, just freedom. The male was concentrating, hence his silence. His big muscled coat moved slowly and carefully, like he was stalking a prey, yet his head was straight up and his ears were perked. He looked up to see several wolves sitting on the balcony, looking down at all the news wolves that came here to choose their faction for life. Daigo huffed at them as he sat down somewhere, staring back at them with narrowed eyes. ‘’What are you looking at?’’, he asked them, but it was only in his thoughts. Afraid he would lose his only chance to become a Dauntless by saying such things he preferred to keep his mouth shut. Only this time. He wanted to become part of the Dauntless, he had to. It had been his one and only dream ever since he had been a little pup. He had wanted to become a Dauntless all his life, sadly he had been born in the wrong faction; at least, in his eyes it was the wrong faction, for him. He had been born in Erudite and he had been raised with lots of facts and knowledge from his parents; he knew a lot, but he preferred to explore and go on adventures. When he saw the Dauntless for the first time he had been so excited. He had felt pumped to go anywhere they went. Even though his parents said they would keep on loving him as their son even if he decided to join another faction, it still felt like they were keeping him from making this important decision in his life. So now that his family was dead, he felt more comfortable with finally making the right choice. Not that he liked the fact they were dead; he missed his family and would do anything if it meant they could return to him. He even blamed himself for their death, because he hadn't been able to help them, to heal them. He felt like a bad son. Suddenly a door went open and slammed shut again and Daigo perked his ears even more, bending his head forward slightly to get a clearer view on the stage. This female wolf stood there, a sleek reddish coated wolf with white markings. An Ethiopian wolf? Daigo hadn't seen many of those in the Erudite faction but he still knew for sure this female belonged to that wolf breed. Because, his father and mother had taught him almost everything, everything he needed to know. Well, they had tried; he hadn't learned everything because they had perished when he was only a yearling. They had never been able to teach him literally everything. Daigo looked the female up and down as she stood there, his eyes no longer narrowed, though there was a frown on his face as he huffed lightly, through his nose. It as a soft sound, and would most likely not catch any unwanted attention. Daigo tried to stay utterly calm, it looked like he was meditating, compared how he normally acted; wild, rude, rough, reckless, adventurous, afraid of nothing at all. But today; today he was afraid of failing to choose what he wanted to choose. His eyes rolled around the building as he stared at the other new wolves around him, his head never moved an inch. All that time he silently begged to be part of the one and only faction which he thought he was worthy to be part of. Ross stepped forward, her head up and eyes set firmly on the wolves in front of her. She stood proudly, her normal casualness was now replaced with a certain formality. She clenched her jaw and gave a deep breath through her nose. She blinked and tilted her chin upright so that she could see everyone at once, from the top of the auditorium to the bottom by the stage. She looked the wolves closest to her in the eye, switching her gaze from one wolf to the next. This will be the most important day of their lives, she thought to herself as she stared at each wolf individually. Today will be the day where these young wolves decide who they will be, forever. They will not be able to change their fates after this, unless they desire to be with me and the Factionless. She looked over and saw a few more wolves coming in. A large black brute (Daigo) led the group, (an assumption because he posted first)and several other wolves followed behind. A flash of dark maroon on the otherside of the room caught her eye and she looked at a smaller red and white wolf who glanced at her before being devoured by the crowd. She watched her weave in and out of the group and come to the front by the stage. She pushed past several others and sat down in front of her. Ross looked intensely into her amber orbs. She held her gaze on her for several seconds and then moved on to the wolf sitting next to her, and then further down the lines. She didn't move as more wolves continued to filter into the room. Soon all the seats were taken and a crowd of wolves instead stood at the back of the room. She took a deep breath and flared her nostrils. Her one ear flicked slightly in anticipation. She turned and walked slowly to the center of the stage, every step calming and even. She felt her toes curl and forced them to straighten. Her claws clicking were the only sounds in the room as everyone quieted down. She felt hundreds of eyes looking at her, burnin holes into her flanks. On she went until she was standing in the center of the stage. She became instantly aware of every aspect of her body. She felt the warm lights, shining down on the stage and the surrounding areas of the room. She felt her blood being pumped through her body and heard her heart beat. The wood floor was cool under her paws and a fly was buzzing somewhere in the audience, likely attracted to the lights. She smelled all the different scents from each faction and from each individual. She could practically see the tension in the room. She felt it in the air, like electicity before a storm. It rippled in the air like waves. She calmed her self with a final deep breath and closed her eyes for a second. When she opened her eyes she looked at the wolves with a new sense of confidence. Here we go. She sat down and a small smile cracked her face. "May I have everyone's attention please!" Lucifer drowned in his surroundings to memory. The Hub was rather lively. It had to be. It was the Choosing Ceremony. He sighed and strolled in, his pelt shaking as he did so. He looked to his facrion proudly. The Dauntless cheered and roared with bouts of pride and intensity. He smirked, knowing what he would choose, what faction he truly belonged to and the people he belonged with. The brave, the mighty. He looked over to the other factions, some arguing, some chatting amongst themselves while some were playing games. 'Oh the Amity' Lucifer chuckles to himself. He walks over to where his faction was placed and awaited further instructions from the person talking up front. At the same time, Lucifer scouted the area. His eyes darting through and forth the crowd, searching for competition. Habit. Lucifer shook out of his competitive thoughts and focused on the wolf up front. He smirked. "I could take her" he chuckled. Lucifer looked toward the Abnegation. A rather intruiging faction, in his opinion. He suddenly had second thoughts. 'Be brave, or be selfless' he asked himself. He shook his head. Once a Dauntless, always a Dauntless. He wondered, what of the new members.of Dauntless. How would they get used to such a hostile lifestlye in such a short time? They had better, or they'd become factionless. Lucifer scanned the area.with his eyes, looking for potential faction transfers. He laughed at the thought of someone from Amity, coming to Dauntless and vice versa. Lucifeera hurried to the Hub, noticing she was rather late and she didn't want to be Factionless. She panted and sprinted, hoping she'd make it in time, which she did. She huffed and gave a large sigh of relief. She joins her Former faction, Dauntless. She knew her father was somewhere watching, she didnt want to see the disappointment in her father's optics. She pays attention to the front as another being begins to speak. Lucifeera takes her place and sits herself down beside a large Dauntless male. Hearing what he said under his breath caused Lucifeera to laugh quietly to herself. She smiles but it disappears quickly as she didnt want the brute to know she was listening to his conversation with himself. Her tail flicks and thumps, she was nervous. How would the Dauntless react to her choice of joining the Abnegation? She sighs to herself. Ultimately it was her life, and she was the only one living it. The thought of joining Abgnegation excited and thrilled Lucifeera. "Just get to Choosing already" she says under her breath, wanting everything to speed up. She felt herself get giddy and overly excited. She kept her eyes out for the Grey Pebbles. The Grey Pebbles which soon will have her blood on it. Blood she was willing to shed. Lucifeera diverts her attention to the other Factions. And most importantly, the Abnegation. She smiled, seeing the Grey pelted wolves. She was soon going to be one of them. She couls hardly wait. Mentioned in order - Ross, Lucifer. Azimuth strutted in, one of the last of the Candor to arrive. Sure his mother would have had a heart attack seeing how tardy he was, but she was at home, too caught up in her work to attend the Ceremony. He wondered if her and his father even knew that their son would be leaving them forever in just a short while. Did they even notice him leaving this morning? Probably not…Oh well, Azimuth found he wasn’t bothered. The less he associated with them, with the whole of his useless faction, the better. They were all cretins, with their honesty and silly belief in everything being black and white. He was appalled that he had been born into such a pathetic faction. But Azimuth cleared his head of such sour thoughts, today was the beginning of his new life, where he was in the right faction. Finding his seat, Azimuth looked at the sea of wolves mingling about. “So typical…” He muttered, watching the Dauntless rough around and the Abnegation do everything they could to avoid attracting attention. The sounds of arguments and debates were, as always, to be found with the Candor, just as grating and annoying as ever. 'And there’s the Amity,' Azimuth noted as he saw a laughing wolf prance across the stage, caught up his silly game. Fools, the lot of them. So many wolves throwing the opportunity of a lifetime away by selecting lesser factions. There was only one way to success, and it began for Azimuth with the bowl of water on the stage. Erudite, the intelligent, how many years had he longed to join their ranks? And now it was finally here. Another wolf would have been shaking in their seat with anticipation. He looked around again, saw the Erudite wolves with their sleek pelts and curious eyes, and a small smile came to the features. Yes…the other wolves could waste their lives by joining other factions; it just meant more power for him. When a small female wolf came onto the stage, Azimuth immediately fixed his gaze upon her, wanting to get the ceremony started. 'The sooner I’m where I belong, the better,' he thought. Fides was late. Oh so very late. He trotted briskly through the doors and sat with his family in the Dauntless section. His mother gave him one stern look over and he rolled his eyes. Didn't she stop to think that she was about to loose her only son for the rest of her life? No, because he had told her that he would remain in Dauntless. Duh. He shook his head exasperated with the fae, and sat impatiently. His head in a constant swivel for the first time, he took in his surroundings. Over on one side, wolves playing, laughing. Amity. He turned his head, and saw sleek wolves watching others and talking in professional tones. Erudite, the know-it-alls. Rolling his eyes they landed on other wolves, skinny and not drawing any attention to themselves. Abnegation, the Stiffs. His eyes suddenly landed on one faction, arguing and debating. Yes, that was the one. He Had longed to join their ranks, where he could no longer hide his personality to suit his parent's need. Speaking of, His siblings were fighting, again. He shoved his massive shoulder in between the two of them, breaking them up. "Will you stop fighting! You are about to make the most important decision of you life!" He half shouted at them muttering insults under his breath. As a wolf entered the stage he looked up, his eyes growing hopeful and excited. The time that he would be able to leave said family would be the turning point of his life, without worry. Ross looked around and waited patiently for everyone to stop speaking. The low voices quickly settled into still silence. She smiled at the crowd and raised her head. "I am sure everyone knows why we are gathered here today." She gave knowing glance at the young wolves in front of her. "I will try to make this speeh brief, as we have a lot of wolves to get through today. This is the Choosing Ceremony where all the young wolves will pick their Factions, to which they will dedicate themselves for the rest of their lives. It is important that you pick the right Faction for you on the first try. After this moment you will not be able to change your mind, nor back out of your chosen Faction." She paused for a second, letting the feeling of finality settle. She looked at all the wolves, about to make the most important decision of their young lives. "In front of me are the bowls of the six different Factions you may choose from," she stood up and walked behind the bowl farthest to her left. "These grey stones stand for Abnegation, the Faction of Selflessness. I will be my undoing if I become my obsession." She stepped over to the next bowl. It's glass surface shimmered brightly under the strong lights. "This soil from the earth stand for the Faction of Amity, the Faction of Peacefulness. You must no longer think cruel thoughts. Cruel thoughts lead to cruel words, and hurt you as much as they hurt your target"
The next bowl appeared almost empty at the first glance, and she hesitated a moment before speaking. She looked back up again at her audience. "The bowl of Candor, filled with glass and stands for the transperancy given when there is only truth because, dishonesty is rampant, dishonesty is temporary and dishonesty makes evil possible." The bowl after was very hot and she was very tempted to take a step back to avoid singing her fur. "The hot coals in this bowl represent Dauntless, the Faction of Bravery. We believe in freedom from fear, in denying fear the power to influence our decisions. We believe in ordinary acts of bravery, in the courage that drives one person to stand up for another." The second to last bowl held cool water, that was a nice relief from the heat of the Dauntless. "The Faction of Knowledge is the Erudite, represented in this bowl by water. “Ignorance” is defined not as stupidity but as lack of knowledge. Lack of knowledge inevitable leads to disconnect among people with differences. Lack of understanding leads to a disconnect among people with differences. Disconnection among people with differences leads to conflict." She moved over to the last and final bowl which was on her far right when she sat in the middle. "This last bowl contains nothing. It represents the Factionless and the Divergent. Those who can not chose a Faction or who don't fit in with any of the Factions will come here." She turned and walked back to the center of the line of bowls and sat behind them. "To choose your Faction you will walk up and cut the inside of your foreleg and let your blood drip down into the bowl you pick. After that there is no going back. You will turn around and join your new Factions. I will call you down in reverse alphabetical order. First, from Amity, Zahaira.."
A small black wolf walked up the steps to the stage and stood in front of Ross. She nipped the inside of her foreleg and, after a slight hesitation, held it over the bowl of soil and dripped her blood into it. The Amity Faction cheered and she turned and rejoined her Faction, a large smile on her face. "And next for the Choosing Ceremony we have..."
”We believe in ordinary acts of bravery, in the courage that drives one person to stand for another" said the wolf up front.Lucifer’s tail thumped excitedly, the corners of his mouth pulled up into a prideful smirk as he listened in on the speech. He looks beside him to see a fae of cream. He raises an eyebrow in confusion as he had not seen this Fae before. The Fae looked a bit too, soft, for the Faction of Dauntless. He opened his mouth to speak but the speech of the wolf in front caught his attention once more. ’Questions later’ he told himself.”And next for the Choosing Ceremony is…”. Lucifer beamed proudly as he stood up. He walked to the front even before his name was mentioned. Flashing his ever-growing grin at the other Factions and puffing his chest out, he makes his way to the bowls. Lucifer suddenly hesitates. ’Am I making the right choice?’ the brute of amber and gold asks himself as he stands in front of the bowl of coal. His expression turned into a slightly frightened one. But that expression only lasted a few seconds before the smirk of his returned to his face. ’Heck yes, I am he thinks to himself once more. He raises his foreleg up and bares his ivories before bringing them down upon his foreleg and he bites down. Soon, blood tears down from his paw and he holds it over the bowl of hot coal. A drop of blood falls. The sizzling of coals sends shivers running down his spine. The loud and obnoxious cheers of The Brave gave him a sense of Euphoria. He turns back to beam proudly at them, his chest pumped out and tail raised high proudly. He walks back to where he was seated earlier, next to the Fae of Cream. ”See you in initiation” he says to the fae before flashing a wide smile toward her direction. Lucifeera’s heartbeat picks up when the Fae up front mentions the Abnegation. Her eyes dart over to where the Abnegation were, their heads down and their sleek and skinny pelts shining. She smiles and sighs contently. Lucifeera suddenly notices the Brute next to her was staring. He opened his mouth to speak. ”Please don’t speak to me. Please do not ask me any questions. I’m invisible. You cannot see me. I cannot be seen” Lucifeera thinks to herself, quietly wishing he would not say anything. Lucifeera always got nervous when talking to people she wasn’t comfortable with. Especially males. And this was a Dauntless male. Worse. To her luck, he got called up on stage. So he was the one they called Lucifer. Lucifeera’s heard many times of that name, but she’s never actually seen the wolf who owns that name. Now she has. She sighs once more, out of relief this time. Of course he chooses Dauntless, which earned shouts of joy erupting from the crowd of Dauntless. He walked back to where his original place was. ”See you in initiation” says the Brute, Lucifer. He assumed she was going to choose Dauntless? ”What makes you think I’m going to join the Faction of the Cruel and Coldhearted?” she thought silently. She stood up. ”Unlikely” she says to the Brute, hanging her head low. It was her turn now. ’Lucifeera’ her name was called up. She could hear a scoff, coming from her very own flesh and blood. Her father, Korken. She tries to ignore him. Her eyes stung from the back as she walked down to the front. She wouldn’t get to say goodbye to her family. She will never see them again. And for once, that’s a good thing. She steps up to the bowls. Lucifeera’s breath hitched, she has not felt so much pressure in her lifetime, even from her father. She held up her foreleg before ripping it with her teeth. She winces. Lucifeera looks to the bowls and her eyes dart between the coals of Dauntless and pebbles of Abnegation. After what seems like forever, she holds it over the pebbles. She lets her blood drop on the pebbles and cheers erupted from the Abnegation. Even though the cheers from the Selfless lifted her spirits, she was still hurt as she heard disappointed murmurs from Dauntless. ”First faction transfer” she over hears someone say. She set her foreleg back down before walking to the Abnegation. They smiled at her, friendly and genuine. She’s never experienced anything like this before. So many friendly, warm and welcoming faces. She knew she made the right choice and now she was on her way to becoming Selfless. ”Welcome to Abnegation” says a grey pelted wolf beside her. Lucifeera nods and smiles in return of the wolf’s greeting. Her gaze lands on her family all the way on the other side of The Hub. Her father catches her gaze and shakes his head. Lucifeera had shamed him. Her expression turned sour. ’Good luck without me’ she says in her thoughts. "The bowl of Candor, filled with glass and stands for the transperancy given when there is only truth because, dishonesty is rampant, dishonesty is temporary and dishonesty makes evil possible." Fides nodded his head at these words, and felt himself stand up when the ceremony began. His name started with an F, so he would most likely be in the middle. Watching as one male went up, Lucifer was his name, he chose Dauntless. Then another female went up and chose Abnegation. She seemed to come from another faction, she was the first transfer there was. Before he knew it, he was walking up the stage and standing in front of the Ethopian wolf. He was biting the inside of his leg and was about to hold it over the coals, when he stopped. He had lied when he told his parents he was staying. 'I guess the lies stop here.' he thought as he watched his leg move over the Bowl of glass, and it was stained red with his blood. The cries of outrage from his family was heartbreaking. He would have done anything for them, anything at all. but that was the thing. Would have. He couldn't anymore. Smiling, he joined the debating faction he had dreamed of, known as Candor. He was an Initiate for them now, and he would never let a lie leave his lips again. "Traitor! Liar! No son of mine! Don't expect me to come visit that day! You are no son of mine!" His mother screams are what made him close his eyes and sit down, his head bowed. Shame racking through his body as he licked where the blood had stained his white fur red. He glanced up once to see his mother crying into his father's shoulder. He never looked back on them again. Not once. Diabla sits and watches as one by one wolves get called up. First, a male by the name of Lucifer returns to his faction, Dauntless. Second, a female by the name of Lucifeera leaves Dauntless for Abnegation. She is the first transfer. Third, a male by the name of Fides leaves Dauntless for Candor. I'm assuming it will be my turn now or after a few others. I hear my name being called, and I am glad to know I was correct. I stand up and slink forward, trying to appear as small as possible. The sanguine fae paused, reminding herself that soon she would no longer have to do this. She no longer had to worry about pleasing her parents ever again. Diabla continued to the front and looked down at the bowls, only glancing at the water once. In that moment she feels regret, but then looked over at the Dauntless bowl, blood sizzling on the hot coals. Taking a deep breath, she approaches the bowl and she knows she has made the right choice. Diabla lifts her fore-leg to her jaw, then carefully bites it, drawing only a small amount of blood. She wouldn't want to injure myself to badly right before Dauntless initiation. With her paw held over to bowl, a drop falls into the bowl. As soon as it falls in, sizzling on the coals, I hear a cry of outrage from the direction of my family, along with many disapproving grumbles from the others. Although Erudite disapproves, Dauntless drowns them out with their extremely obnoxious cheers. I rise to my full hight and bound over to my new faction. I happily sit amongst their ranks. ‘’May I have everyone's attention please! I am sure everyone knows why we are gathered here today. I will try to make this speech brief, as we have a lot of wolves to get through today. This is the Choosing Ceremony where all the young wolves will pick their Factions, to which they will dedicate themselves for the rest of their lives. It is important that you pick the right Faction for you on the first try. After this moment you will not be able to change your mind, nor back out of your chosen Faction.’’, the female wolf on the stage started to speak, and she continued. Meanwhile Daigo was shifting around on his hind a bit, nervously and impatiently. ‘’In front of me are the bowls of the six different Factions you may choose from. These grey stones stand for Abnegation, the Faction of Selflessness. I will be my undoing if I become my obsession. This soil from the earth stand for the Faction of Amity, the Faction of Peacefulness. You must no longer think cruel thoughts. Cruel thoughts lead to cruel words, and hurt you as much as they hurt your target. The bowl of Candor, filled with glass and stands for the transparency given when there is only truth because, dishonesty is rampant, dishonesty is temporary and dishonesty makes evil possible. The hot coals in this bowl represent Dauntless, the Faction of Bravery. We believe in freedom from fear, in denying fear the power to influence our decisions. ‘’Yeah yeah, we know, we know!’’, Daigo thought as he listened to her every words, it rung in his ears, ran through his mind, he already knew all about it. He was so impatient now, he really wanted to choose, he needed to choose. He watched how several wolves were called over to the bowls one by one and he listened to their names and imprinted their choices in his mind. The first one was a female who decided to stay with her faction, but her name was forgotten by Daigo straight after she had returned to her seat. She stayed in her own faction, so was not really that important to Daigo. This male had more interest in seeing who decided to join Dauntless or change their fate by choosing a different faction than their own they were born in. The female who had been sitting next to Lucifer was called; her name was Lucifeera. Funny, they almost had the name name. Yet his was a male name and hers was a female name. He guessed she would choose Dauntless too to remain in her old faction, but instead she chose Abnegation. Daigo frowned as he watched her take her seat in her new faction. She was greeted by those faction members. Daigo huffed; Dauntless was better, why had she left? The next one in line was a male called Fides. He came from Dauntless, yet he chose the faction Candor. Daigo suppressed a growl in his throat. Dauntless was the best faction there was, why were they leaving? Daigo could hear the angry screams from the mother and father of this wolf but blocked them out soon after; these screams were not meant for him, they were of no use to him. Daigo felt so uncomfortable sitting here in the Erudite faction, looking up at the wolves from his own faction. He thought a few stared down at him, unsatisfied with him; most of them wanted him to leave Erudite and choose another faction, because he didn't belong with the Erudites. And Daigo agreed with them; he couldn't wait to change factions. Next was a female called Diabla who came from Erudite just like Daigo. He watched her carefully and a smile grew on his face as she chose Dauntless. Daigo watched her leave and sit there among the crowd. ‘’And now for the next Choosing Ceremony we have from Erudite, Daigo.’’, the voice called and Daigo sighed in relief, he could finally breathe, almost. Getting to his paws he quickly walked over to the six bowls, not wasting any time anymore. He looked over them carefully, looking at each one of them first. Did he really want to become Dauntless? Or should he stay in Erudite? Was Factionless a good choice, Divergent? No, Dauntless it was, it had been his dream since he was little, and some of his faction members didn't want to have him in Erudite, so he should leave. Daigo brought up his paw and bit the skin above it, in his fore-leg. Stepping towards the bowl filled with coals he let his blood drip onto them; Dauntless, he had chosen Dauntless. Hr heard cheers coming from Dauntless and a few annoyed grumbled from Erudite, though, some sounded relieved as well. Daigo turned around and went to sit with his faction, Dauntless. He had made the right decision, this would be his faction for life and he was happy with his choice. He was satisfied. Daigo finally felt whole now, his life as complete. Addressed: - Mentioned: Ross, Lucifer, Lucifeera, Fides, Diabla Word Count: 1120 Notes: Long post oh dear. I'm just so happy I could finally post. x3 Oh well, I could sort of finally post. The pale-colored male couldn't help but grin as the Erudite bowl was mentioned. The time was finally here. Azimuth sat and watched eagerly as wolf after wolf went up and chose their faction. Since his name began with an "A" he would be one of the last to be called, and while that meant he would be waiting an awfully long time, for once, the wait didn't seem to bother him. He would have his turn eventually, so he sat quietly, watching the ceremony proceed. A few of the choices were predictable, such as the large brute who confidently walked to the front and chose Dauntless after a brief moment's hesitation. Azimuth would have been surprised if he had chosen differently. Then there was a female who came from Dauntless and switched to Abnegation, the first transfer. She looked nervous and timid at first, but once her choice had been made, she happily went to join her new faction. The ceremony continued on for a while more, crawling though the alphabet. No other wolves caught his eye until they called a Dauntless male forward who chose to transfer to Candor. 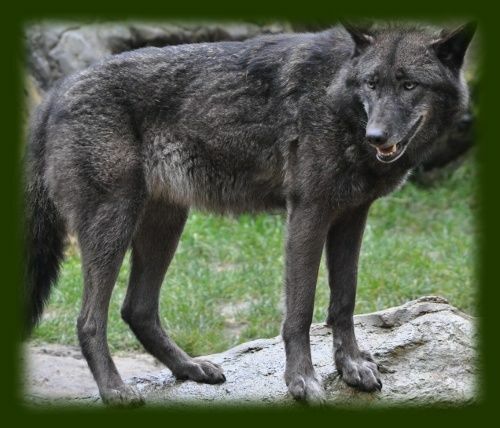 What Azimuth presumed was the wolf's family screamed at him for leaving, but the male didn't look back once, and Azimuth could admire his resolution. Next, right after each other, came a pair of Erudite wolves who chose Dauntless. Azimuth frowned at their decision to leave, but looking at the two of them, he had to admit they looked better suited for Dauntless. And now, as the female at the front finished calling up the "B" names, Azimuth prepared to walk up. "Next for the Choosing Ceremony, from Candor, we have Azimuth." At the sound of his name, he stood. His gaze was set firmly on the bowl of water as he approached the stage. He had no family there to support him, and he knew no Candor wolves would miss him, so he made his selection without any doubts or regrets. His eyes fell on the bloodied water and he thought about how long he had waited to make this choice. With a slight smile, he bit into his fore-leg and held the limb out over the water, watching as his blood dripped down and mingled with the blood of all the other wolves who had chosen the only faction that mattered. Erudite cheered for him, and Azimuth beamed with pride as he went to go take a seat with his new faction. He didn't cast a single look back at Candor, as that chapter of his life had closed. He was an Erudite wolf now, just as he'd always planned. Ross finished going through all the young wolves. There were a lot this year. She looked down at the bowls before her. All the elements were stained with the blood of the new generation. The Factions are growing fast, she thought to herself. Her audience was divided up again by Faction. Some wolves cried, while others cheered. Parents wailed for their young who left their home Factions. They wouldn't be able to see their children again. Except for Choosing Ceremonies and Visting Days. Faction before Blood. She stood up and stepped in front of the bloodied bowls. She held her head up and pricked up her ears. "Congratulations everyone on you selections today. May these newly built Factions continue to thrive." She announced to the crowd. "I hope every new initiate gets to know their Faction well, as you will be with this new Faction for life. Once an aquaintence has been made with your Faction members, initiates will travel to their Faction headquarters, there Initiation will take place. Leaders, congratulations on your new members. Initiates, I wish you all good luck." Ross stopped talking and nodded her head. The ceremony was now completed. She turned and walked down the stage toward the stairway. Writers block, sorry ya'll, real short today. Will be longer next time. Ideas needed for Faction Initiations. Ross will administer Faction Initations for the first time, as leaders will be decided at the end of this month for each Faction. PS thank you all so much for staying active! Daigo sat among his new fellow faction members, his faction for life. He was happy, he was excited, he was ready to jump rooftops and be reckless. He was ready to fight, run, climbs. It felt like he could fly. He was so excited, he was pumped. He barely could sit still, but forced himself to, anyway. He sat there smiling at those who had greeted him, and at the new wolves hat came to this faction or returned. Dauntless was big, Dauntless was great. Dauntless was the best. Daigo watched how this one male, the last of all, came from Candor and went to Erudite, the faction Daigo had left. He couldn't understand the male's choice and huffed, but guessed he was more suited for Erudite than for Dauntless. That was for sure. Suddenly the female on the stage spoke and Daigo looked up, ears perked and body alert, sitting in a straight position as he looked at her. ‘’Are we done? Can we go out?’’, he thought, excited to leave this place and go to the Dauntless' headquarters, and meet all the other Dauntless there. He was truly excited. ‘’Congratulations everyone on you selections today. May these newly built Factions continue to thrive. I hope every new initiate gets to know their Faction well, as you will be with this new Faction for life. Once an acquaintance has been made with your Faction members, initiates will travel to their Faction headquarters, there Initiation will take place. Leaders, congratulations on your new members. Initiates, I wish you all good luck.’’, the female on the stage spoke and Daigo nodded, shifting around rather impatiently. ‘’Yeah yeah, we know. Thank you.’’, he thought, becoming a bit irritated, as he watched her turn around and leave the stage. And then she was gone. She had left. And Daigo was ready to go to his new faction, his new home. He was pumped. Lhouraii's had found her place among the other Amity wolves. Again. She had been in that Faction all her life and she despised it and her fellow faction members. Yet during the Choosing Ceremony she had decided to stain the bowl filled with sand with her blood. She had gone back, returned to the devil's place; to the devil's servants. At least, Amity was like that in her thought, but all the other Factions were to her like that, as well. The worst places in the world, the worst choices, all of them. She smirked at herself; the fact that she hated everything in life made her laugh, even though she had no idea why. She guessed it was because she was disappointed in herself, or she found herself a fool. Did she pity herself? Maybe that was another fact, too. But why would she pity herself? Because she couldn't make choices? Because she couldn't let go of what she knew? Was she afraid to leave? No, she had not been afraid. She had wanted to leave Amity her whole life now, she had wanted to choose a different Faction. Yet, she had not; she had gone back to that devil's place, as she liked to call it. Why? She actually had no clear answer. Not even to herself. She smiled at the thought of Abnegation wolves thinking they were hideous. It made her crack this bright innocent smile which would get annoyed if you looked at it for too long. ‘’Oh and there is Erudite. The ones that know everything. Well if they know everything, does that mean they know my true self? Then they must be freaking mind readers. Knowing everything; they know nothing.’’, Lhouraii continued. After she was done looking at all the Erudite wolves her eyes fell on the Factionless, the Divergent. She huffed at them. It was a huff anyone could hear and afterwards she felt a bit stupid for making that sound. She had never really huffed before in front of anyone else; she had let her guard down, she couldn't do that. Everyone thought she always smiled. She had cried before, yes, but that had all been a scene. Just like those smiles. Those freaking smiles that hurt her lips. They hurt her jaws. ‘’Factionless. Everyone can fit in there. Or those who don't fit anywhere go there. I should have gone there, maybe. I don't fit anywhere, either. Though, Factionless are those who are afraid. They choose to become Factionless because they can't handle any of these Factions. I'm brave for staying at this hellhole.’’, Lhouraii thought and with that last thought she was done being negative about all the Factions around her. She hadn't really thought negatively about Amity yet, or made a rude joke about the Faction. But that wasn't needed, because she was Amity's main joke. Ross walked to the group of Abnegation members. They were standing awkwardly, the new initiates at the front. She nodded to them and gave them a friendly smile. "Hello," she said gently. "Please follow me. I will take you to your Faction Headquarters and we will begin your initiation to Abnegation." She waited a few seconds, to see if there were any questions. She nodded quickly, never dropping her smile, and turned toward the side door. She opened the door and led the group down the stairs. There was a loud clatter of nails clicking on the hard stairs as they made their way to the ground. She opened the door and let the initiates out of the building. She walked slowly down the sidewalk after them, gradually getting to the front of the pack as they went to the inner city, the location of Abnegation headquarters. Ross walked quickly to the Amity Faction. She couldn't help crack a grin at the new initiates antics of joining their new Faction. They were playing games again, now that the ceremony was over, and appeared to love making more noise than necessary. "Hello everyone," she said, above the racket. She waited a few seconds for them to calm down and get their attention. "We will now be leaving for Faction Headquarters." She waited briefly, then she gave a quick, "Please follow me." She walked toward the elevators and they went to the bottom floor. She waited at the door for the large Faction to filter out and stand on the sidewalk. She led them on a gentle lope to the bus station, some members were already starting to sing and yip. They got aboard a crowded bus and drove toward the gates surrounding the city. Ross walked purposefully to the group of Candor initiates, debating playfully in their Cador way. "Attention everyone," she said over the arguments. "We are leaving for headquarters now to begin initiation. If there is any questions please ask them now." She watched the group. If there were going to be questions, this Faction would be it. She nodded. "Very well, please follow me." She walked swiftly toward the elevators at the side of the stage. They rode the elevators down and stood at the front of the building. They trotted eagerly toward the edge of the city. Ross went briskly toward the Dauntless initiates. "Attention everyone. We are going to headquarters now to begin initiation." Without introduction, or waiting for questions, she took off for the stairwell. She rushed through the door and pounded up the steps at a furious pace. "Come on everyone! Move it! Move it! Lets go!" She reached the top of the stairs and raced across the roof of the building. A few feet from the edge of the roof were a series of tracks. Train tracks. She put her front paws up on the edge of the building and watched as the train got closer and closer. When the horn was almost deafening and the train was almost upon them, she yelled, "Jump." She flew forward and landed easily in the inside of one of the box cars. Several initiates also joined her in the first car. She hung her head out the side and watched the Dauntless compound come closer and closer. Ross strode up to the Faction of current and future intellectuals. "Greetings everyone. My name is Ross, if you would please follow me I will take you to your Faction Headquarters where we will being initiation." She waited for questions and then turned to the elevators. They rode the elevator down to the ground and walked out the door. There was a constant mumbling as she led the group toward the exact center of the city, where huge glass buildings towered over them as if reaching for the sky. For an Amity wolf Lhouraii was oddly quiet. Everyone in Amity knew that, but they didn't suspect her. She had been like that all her life, quiet. And of course, they assumed she was probably just very shy, or a bit overwhelmed after the Choosing Ceremony. There were more shy wolves, in every Faction. They couldn't blame her. Not that Lhouraii cared if they blamed her or not. She would probably act like she did are, but in truth she did not. She was too far gone to care about anyone's words or thoughts. She had been daydreaming slightly, still debating with herself whether it had been a good or bad decision to choose Amity again. Why hadn't she chosen another Faction? She really had no reason to, no reason for anything. She acted, never thought. Well, she did think, but not really about the consequences of the choices she made in life. She hadn't noticed the Ethiopian wolf coming their way and was a bit shocked when suddenly she met the female almost right in front of her nose. Lifting her head she looked at her, a smile on her face. It hurt her jaws terribly. ‘’Hello everyone.’’, the female said and Lhouraii wagged her tail in a greeting, but she was far from happy to see someone's face. However, she still forced out a simple, cheerful sounding ‘’Hello~’’. ‘’We will now be leaving for Faction Headquarters. Please follow me.’’, the female said and Lhouraii nodded. She got to her paws and shook out her fur before following the line of Amity wolves. She had waited for the others to get up and move first, because she wanted to walk in the back. She always walked in the back. They wet over to this elevator and Lhouraii stared at it for a moment; the thing was huge. Sarcastic, she was sarcastic again like always. But she never said a word. She only thought. Stepping inside the elevator she sat down and waited for the thing to move, drowning in her own thoughts again. Amity wolves that addressed her with a smile, she simply gave a smile back, keeping her words for herself, before staring off into nothingness again. Why hadn't she chosen Factionless again? Oh yeah, because those who did were weak, and she was brave to look into the eyes of her monster, she dared to step her paws back into the burning hell she had come from. She could have had a chance to leave that hell forever but she had been brave enough to stay. Every other place would be hell for her too, anyway. So she preferred to stay with the hell she knew. Since birth. They reached the outside and certain Amity wolves began to yip and sing happily, but not Lhouraii. She was in the very back, not saying a word, yet smiling all the way. Even her eyes smiled, though that was all an act. It was all fake, it was all a lie. And no one knew. And no one would ever know. They went on their 'merry' way to the bus station and Lhouraii was the last one to aboard the bus, sitting amongst the crowd. The buss was full of wolves, it made her feel a little bit unwell, but she managed to keep her steady position and held her head high, still with that smile on her face. No one would see the truth. Never. She looked out of the windows as they drove off towards the gates of the city, because outside was their territory, their home. Her hell. ‘’Here we go again. I'm coming 'home'...’’, she thought, depression taking over again, but he forced the smile to stay on her face. She never had any other expression on than a happy smile. ‘’Attention everyone. We are going to headquarters now to begin initiation.’’, the female from the stage said as she reached the Dauntless wolves. Daigo looked up and immediately jumped to his paws. Finally! He was ready to get a move on. ‘’Yes! Let's do this!’’, Daigo said excited. ‘’Come on everyone! Move it! Move it! Lets go!’’, the female said and she ran off towards the stairs without saying anything else. Daigo started running as well, keeping up with her. He wanted to be the first one to reach the Headquarters. Because he was a true Dauntless. He had always been one. ‘’We just became Dauntless and we're already going to the limit? I love it!’’, he thought, excitedly running up the stairs, after the female. They reached the top of the stairs and run across the roof, and soon Daigo saw the train tracks. He had heard about this before when he had still be in Erudite. The new Dauntless would jump into the train. And the train was coming. He heard the horn and looked at the huge thing coming their way. They had to hurry if they wanted to make it. And then there was the train. ‘’Jump.’’, the female said and Daigo nodded, an excited smirk on his face. He saw the female jump into the train and he ran long the tracks, running beside the train, making it a bit harder for himself to get on. When he saw an opening he jumped and almost slipped with his rear paw, but he managed to get inside and stood there panting for only a few seconds, looking at the Dauntless that were already in as he waited for the last few ones to come, too. If they didn't make it then that was their problem. Dauntless only had place for true Dauntless wolves.